“Bucky” Fuller (1895-1983) called himself a “comprehensivist.” Considering himself worthless in his twenties – a “throwaway” – he decided to dedicate his life to seeing if one individual can really make a difference. He trained in engineering and architecture and his investigations of nature’s blueprint allowed him to become one of the 20th century’s most prolific inventors. 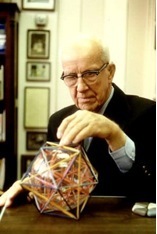 He is most famous for inventing the geodesic dome and the Dymaxion car and house. But perhaps Bucky’s most profound legacy will turn out to be how he revealed the structure of the Unified Field which he called the “Cosmic Octave Hierarchy.” Check out the Buckminster Fuller Institute to see how his work continues to inspire innovation.